With a stay at Hilton Sydney, you'll be centrally located in Sydney, steps from Queen Victoria Building and The Galeries. 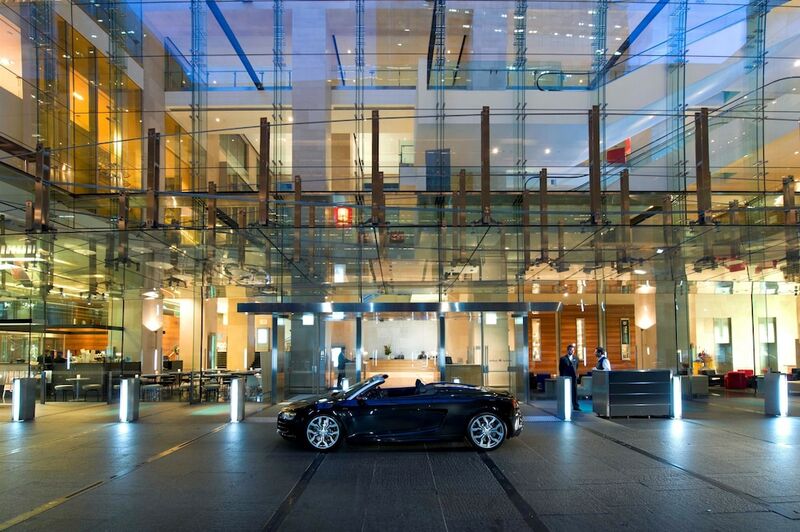 This 5-star hotel is 0.1 mi (0.1 km) from Sydney Town Hall and 0.2 mi (0.3 km) from Strand Arcade. Make yourself at home in one of the 579 air-conditioned rooms featuring refrigerators and minibars. LCD televisions with cable programming are provided for your entertainment, with wired and wireless Internet access available for a surcharge. Private bathrooms have designer toiletries and hair dryers. Conveniences include phones, as well as laptop-compatible safes and desks. Relax at the full-service spa, where you can enjoy massages and body treatments. You can take advantage of recreational amenities such as a nightclub, a health club, and an indoor pool. This hotel also features wireless Internet access (surcharge), concierge services, and a hair salon. Enjoy a meal at the restaurant or snacks in the coffee shop/café. The hotel also offers 24-hour room service. Need to unwind? Take a break with a tasty beverage at one of the 3 bars/lounges. Full breakfasts are available daily for a fee. Glass - Sophisticated brasserie and wine bar showcasing Australian cuisine with French influences under the direction of acclaimed local chef Luke Mangan. Advance reservations recommended. All day à la carte dining (buffet breakfast also available). Level 2. Zeta Bar - Hip bar with rooftop terrace overlooking the domes of the Queen Victoria Building. Inside, ottomans are nestled around a large fireplace and curtained booths with a Moroccan feel provide extra privacy. Open late afternoon until late. Level 4. Marble Bar - Live music Wednesday–Saturday. The 112-year-old heritage-listed watering hole was extensively renovated and reopened in 2005 as a haven of Victorian excesses with almost 40 varieties of marble, ornate mahogany, and stained glass feature panels. Lower ground. Caffe Cino - Open-plan lobby café serving beverages and light snacks. Located on the lower ground floor of the Hilton Sydney is Fitness First Pitt Street Platinum. Spanning the entire footprint of the building, the club includes a 25 metre indoor heated pool, cardiovascular gymnasium equipped with a free-weights area, and the latest interactive equipment, including the Kinesis fitness, resistance-based training system comprising four panels of grips, cables, and weight stacks that allow for 360-degree, three-dimensional resistance-based motions. In addition, there are two group fitness studios, which run classes including the full range of Les Mills body training classes (Body Pump, Body Combat, Body Attack, Body Step, and Body Balance), spinning, tai chi, Pilates, and yoga. The club also features four saunas, steam rooms, a large spa pool, and pampering treatments from the spa. Access to Fitness First Pitt Street Platinum is complimentary for hotel guests. Approximately 1.5 km from the hotel are the Royal Botanic Gardens offering numerous walking and jogging tracks including the popular foreshore path to the Opera House with impressive harbour views. The Alysium Spa offers massages, facials, and body treatments.